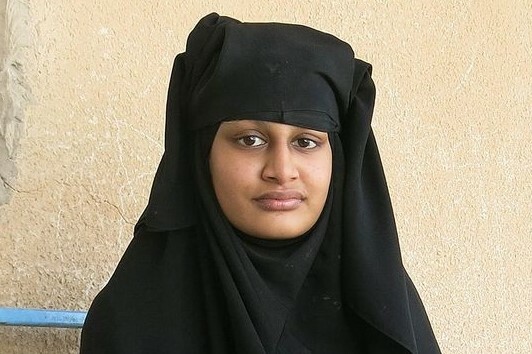 Will UK allow Shamima Begum to return? A British teenager who fled the UK to marry a member of the so-called Islamic State (ISIS) in Syria should be allowed to return, said the father of another schoolgirl who accompanied her four years ago. Hussen Abase urged Britain to take back 19-year-old Shamima Begum, one of three schoolgirls who left London along with his daughter Amira Abase in 2015. "As other people give their comments, my comment is that because she is this country's citizen, their citizen, that she should be allowed,” Abase told Euronews' Damon Embling. Begum and Amira Abase, both of them 15 at the time they fled, left the UK for Syria along with 16-year-old Kadiza Sultana, who was later reported killed in an airstrike. After arriving in Raqqa, Begum married a 27-year-old Dutchman who had converted to Islam. The couple left Bagouz — the last remaining enclave of extremists in eastern Syria — two weeks ago. While her husband surrendered to a group of Syrian fighters as they left, she is now in a camp in northern Syria. Begum's lawyer announced on Sunday that she had given birth to a baby boy. The 19-year-old told Sky News: "People should have sympathy towards me for everything I've been through." In an interview with The Times newspaper, published on February 13, the teenager said she wanted to return back to the UK and said the sight of beheaded bodies did not faze her. A row has escalated since in the UK and Europe as to whether ISIS’ European nationals should be allowed to return. "I would prefer not to have somebody who wasn't fazed by beheaded people and by seeing beheaded heads in a dustbin,” said one London resident in the area where Begum lived. Britain’s security minister said Begum’s lack of repentance was concerning. "I'm not putting at risk British people's lives to go and look for terrorists or former terrorists in a failed state," Ben Wallace told BBC Radio 4's Today Programme. Germany said it can take back its citizens that were suspected of fighting for ISIS, after US President Donald Trump called on Britain, France and Germany to prosecute more than 800 fighters. "In principle, all German citizens and those suspected of having fought for the so-called Islamic State have the right to return," said a spokeswoman for Germany's interior ministry on Sunday. Germany’s government added that it could only take back suspected German ISIS fighters and put them on trial on the condition that they had access to consular and legal advice in Syria.